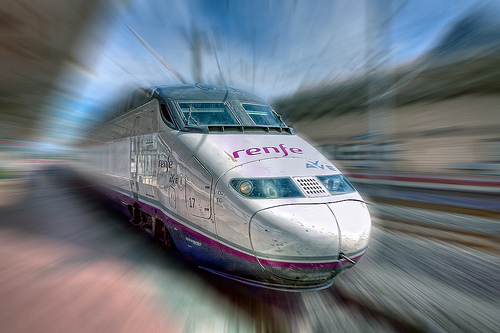 Spain has overtaken France as Europe's high speed rail leader with the opening of a new line this week. Photo by Marc. A proposed high speed rail route that will connect London to Birmingham was announced by the British Transport Secretary. Construction is set to start in 2017, with the first phase to be completed by 2026. With the opening of the country’s fourth bullet train line, Spain overtakes France as the leader in operating Europe’s largest high speed rail network. Now that Russia is hosting the 2018 World Cup, Prime Minister Vladimir Putin promises a high speed rail network to connect all of the World Cup’s host cities before the games start. Toronto’s first headcount of downtown cyclists reveals that about 19,000 people entered the city center on bikes on a typical September weekday. As in most cities, the majority of cyclists (62 percent) were male. Millions of stranded travelers in Europe face the possibility of being trapped where they are in the current Christmas time travel nightmare as severe weather continued to disrupt air, rail and road transportation across the continent. With the removal of fuel subsidies by the central government in an attempt to boost the economy, Iran has seen the price of gasoline jump drastically. Police have been spotted manning gas stations in Tehran to keep the peace. In response to the ongoing onion crisis in India, the national railway agency has asked all zones to arrange for transportation of onions as a top priority. The move comes to ensure sufficient availability of the essential vegetable across the country. The famous Abbey Road pedestrian crosswalk where The Beatles walked across during a photo shoot for the 1969 album “Abbey Road” has been honored as a national treasure in London this week. The Irish Minister for Sustainable Transport and Planning announced that local authorities must include specific cycling policies and objectives in future development plans. “Everything is going underground – even if the inflated price will mean the city’s other plans for rapid transit won’t materialize,” says new Toronto mayor on his plans to nix the city’s light rail plan in favor of subway lines. Europe set new fuel efficiency targets for vans on the continent, aiming to cut fuel bills for small businesses and curb emissions of greenhouse gases related to climate change. A United States federal appeals court rejected a challenge from U.S. oil companies and refiners against the Environmental Protection Agency for retroactively imposing ethanol blending levels and volume requirements for gasoline sales. Ford is using recycled clothes to make the carpet backing and sound-absorption materials found in the Focus, and GM is putting plastic material from the booms used during the Gulf oil spill in the Chevy Volt. A new McDonald’s restaurant has opened in West Virginia but will not be only serving up fuel for human consumption but for cars, too. The fast food joint has installed electric vehicle (EV) charging stations in their parking lot. A new app from the City of Los Angeles uses real-time information to indicate where open parking spots are in the city. The goal is to reduce traffic congestion caused by motorists hunting for parking places, according to officials.